This tutorial focuses on pinhole camera calibration. The goal of the calibration is here to estimate some camera parameters that allows to make the relation between camera's natural units (pixel positions in the image) and real world units (normalized position in meters in the image plane). If we denote the position of a pixel in the digitized image, this position is related to the corresponding coordinates in the normalized space. are the parameters used to correct the distortion. is the distortion parameter used to transform the coordinates from undistorted to distorted images, while is used to transform the coordinates from distorted to undistorted images. It may be useful to make a tour in Tutorial: Bridge over OpenCV that makes in relation the camera model used in ViSP with the one proposed by OpenCV. Note also that the container dedicated to camera parameters is implemented in the vpCameraParameters class. It allows to consider two kind of models; with or without distortion. The calibration process allows to estimate the values of these parameters. a symmetrical circle pattern [grid2d.pdf]. To calibrate your camera you need to take snapshots of one of these two patterns with your camera. At least 5 good snapshots of the input pattern acquired at different positions are requested for good results. To this end see Tutorial: Image frame grabbing and use one of the binaries that could be found in tutorial/grabber folder to grab single shot images of the grid. The calibration tool is available in calibrate_camera.cpp located in example/calibration folder. the resulting parameters are saved in camera.xml file. 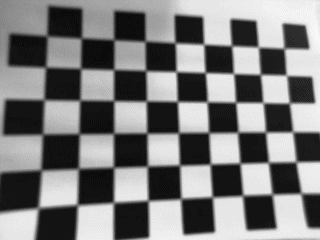 In this section we consider the OpenCV chessboard pattern that has a size of 9 by 6. Each square of the chessboard is 0.025 meters large. We took 5 images called chessboard-01.png, chessboard-02.png, ..., chessboard-05.png. Hereafter we give an example of one of these images. 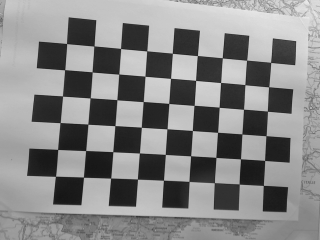 Snapshot example of the 9 by 6 chessboard used to calibrate the camera. # The type of pattern used for camera calibration. The images and the configuration file used in this tutorial are available in ViSP source code and copied in the same folder than the calibrate_camera binary. Camera parameters without distortion successfully saved in "camera.xml"
The resulting parameters are also saved in ./camera.xml file. In this section we consider the ViSP symmetric circles grid pattern that has a size of 6 by 6. Each circle center of gravity is 0.034 meters distant from it's horizontal or vertical neighbor. We took 5 images called circles-01.pgm, circles-02.pgm, ..., circles-05.pgm. Hereafter we give an example of such an image. 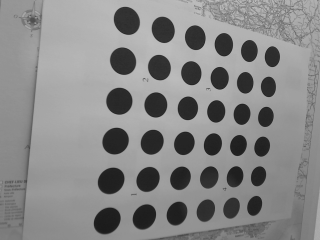 Snapshot example of the symmetric circles grid used to calibrate the camera. Once the camera is calibrated, you can remove the distortion in the images. The following example available in tutorial-undistort.cpp shows how to do it. Then we read the camera parameters with distortion of a camera named "Camera" from ./camera.xml file. Finally, we create a new image Iud where distortion is removed. This image is saved in chessboard-undistort.pgm. The resulting chessboard-undistort.pgm image is the following. chessboard-undistort.pgm image where distortion was removed. You are now ready to see the Tutorial: Camera extrinsic calibration that will explain how to estimate the eye-in-hand transformation when the camera is mounted on a robot end-effector.